A restarted race 1 went the way of Richie Ryan from Peter Moloney and Luke Johnston over 6 laps in the end. In race 2, Luke Johnston got away clean leaving Andrew Murphy to pinch 2nd place from podium regular Peter Moloney. A red flag ended the race on the fifth lap where championship leader Richie Ryan was running 4th place. The Southern Star race 3 was restarted due to a change in weather conditions. Luke Johnston got his head down early on and had developed a healthy lead by lap 3. Richie Ryan rode a sensible race, once title contender Peter Moloney retired and finished in 2nd. James Kelly also rode incredibly well to earn 3rd place and a Southern Star. 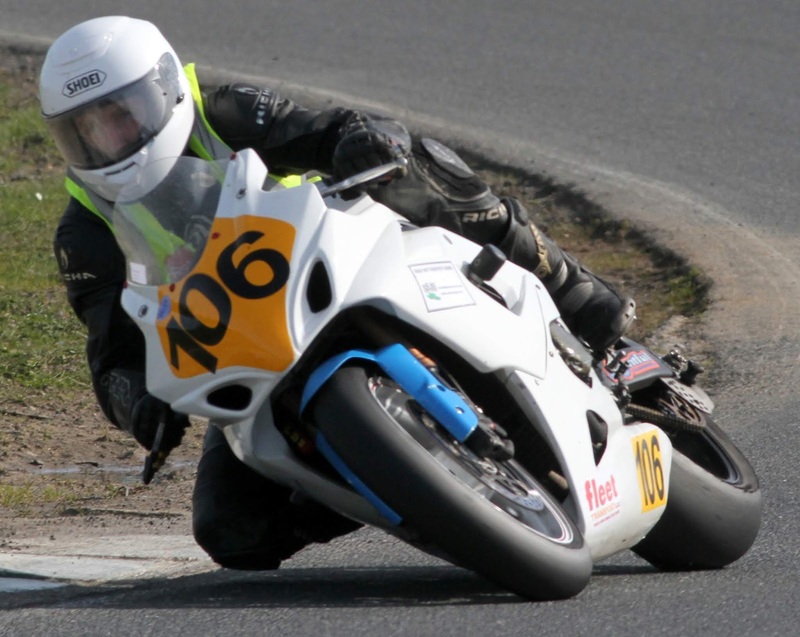 Michael Prendergast won race 1 by 5 seconds from Chris Campbell in 2nd and Jamie O’Keeffe took the third podium spot. Prendergast also claimed the fastest lap of the race with a time of 1.45 on the International circuit. Race 2 was red-flagged as Chris Campbell led from Gary O’Brien and Dean O’Grady. A shortened race 3 was again won by Chris Campbell from Michael Prendergast in 2nd. Gary O’Brien took the last podium spot in 3rd to claim a Southern Star award also. Derek Lynch and Anthony McDonnell led for much of race 1 but, Dylan passenger Mark Gash never let go and eventually got past to win by a slim margin of .2s. Mark Codd and Liam Gordon took 3rd. Dylan and Mark also won race 2 from Derek and Anthony and the combination of Mark Codd\Liam Gordon were 3rd. Race 3 would determine the winner of the Southern Star award and it was a three way battle for a while until Derek Lynch took the initiative. Although Dylan chased him down and put in the fastest lap, Derek and Anthony held on for the win. Mark Codd and Liam Gordon were 3rd. Race 1 went uncontested to Cork’s Derek Wilson from David Halligan and Ray Sheeran respectively. Wilson claimed pole position and the fastest lap also. In a wet race 2, Ray Sheeran went better taking the win from David Halligan. Michael Gillan also impressed with 3rd place. The track had dried for race 3 and it was again a three way battle between Halligan, Sheeran and Gillan. 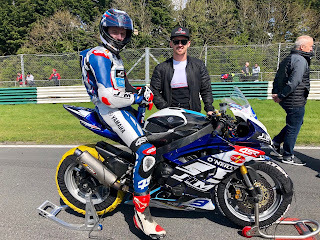 David Halligan took the win and Southern Star award in the end from Michael Gillan and another podium for Ray Sheeran in 3rd, blowing his engine on the last corner but, coasting the powerless bike over the line. Kevin Dempsey took the first production twin win of the weekend from Jamie Collins and Shane O’Donovan in 3rd over 6 laps. Jamie Collins was the victor in the second Production twins outing of the weekend from Shane O’Donovan and Mark Quilligan in third. The Southern Star production twin race was won by Kevin Dempsey with Jamie Collins in 2nd and Shane O’Donovan picked up the last one. Sharing the international track with the 400’s, the Classic Superbikes first race was won by Chris Campbell on the ZX-7r from Des Butler and Robin Heathcote in 3rd. Race 2 was won by Derek Wilson with Chris Campbell in 2nd. Robin Heathcote was 3rd again. In the Classic Superbikes, Derek Wilson took Pole Position. In the Saturday race, Pole Position owner Darryl Anderson took the race win from Damien Horgan in 2nd and Ciaran Loughman in 3rd over 6 laps. Race 2 went to Anderson again from Horgan and Loughman earning all three riders a Southern Star award. Jamie Lyons unbeaten run on Junior Cup continued and it was enough to secure the championship. Nathan McGauran was 2nd and Donal O’Donovan 3rd after an amended result from Race Control. Race 2 was close between Jamie Lyons and Nathan McGauran and Lyons prevailed in the end with Michael Owens in 3rd over 5 laps of the International track. In Race 3, the Southern Star race, Jamie Lyons scored his hat-trick from Michael Owens in 2nd and Scott McCory was 3rd. Alex Duncan won a lonely race 1 from Karl Lynch in the Young Guns category by a margin of 9 seconds to add to his tally of wins for the season. Race 2 was a repeat of Race 1 with Alex in 1st from 2nd place Karl Lynch. Both riders also earned Southern Stars in race 3 with Alex taking the win from Karl over the 5 laps. Race 1 was a tight affair between Dean McMaster and Emmet O’Grady where McMaster just made it over the line with 0.07s separating them. McMaster was on Pole Position but O’Grady claimed the fastest lap of the race. Keelim Ryan joined them on the podium from the Cup class. Race 2 was held over 8 laps with most riders deciding on wet tyres. Emmet O’Grady got away clean and never looked back. Keelim Ryan went one better and was 2nd. Graham Kennedy took the 3rd podium spot. Race 3 was red-flagged with Keelim Ryan in 1st place from Graham Kennedy in 2nd. Graham Whitmore made a welcome return to the podium in 3rd. This was also the result for the Supersport Southern Star. Keelim Ryan had 7 seconds to spare over Kevin Baker in race 1 from 3rd place Trevor Landers over laps. Ryan repeated the result of race 1 with a win from Trevor Landers and Kevin Baker in 3rd. Ryan completed the hat-trick of wins in race 3 Kevin Baker with Eoin Collins taking the last podium spot in 3rd. Race 3 decided the result of the Southern Star Supersport Cup also. Race 1 was rerun following a red flag and Ian Prendergast made the most of the 4 laps winning by over 8 seconds from Colin Murphy. Kevin Madigan took the 3rd podium place. Colin Murphy improved on a damp track in race 2 to win from Ivan Oxley. Mark Culleton was 3rd in tricky conditions. Ian Prendergast also won race 3 to collect a Southern Star from Ivan Oxley in 2nd. The last Southern Star award was won by Colin Murphy in 3rd. Anthony Derrane took the win in race 1 Superbikes from Shane Connolly and John Cahill was just behind in 3rd on the Suzuki. Race 2 was red-flagged on a damp but, drying track. The restart win went to Finian McGahon with Alan Fisher in 2nd and Keith O’Sullivan in 3rd. The Supersport race was won by Chris O’Mahony with John Rock in 2nd.